Adopting professional digital noise reduction with 192Kbps for ensuring high-quality and more clear audio experience. One button recording with 16GB memory capacity (around 288 hour record files) is easy for you to record and store the speaker&apos;s words. Built-in rechargeable Li-polymer battery with micro USB , convenient to recharge and record up to 10h after fully charged. 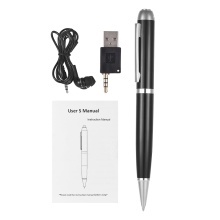 Support to listen to the recording content with earplug (including), or you can listening on the computer via USB, furthermore, your can write by this pen. Made of superior zinc alloy, noble, scratch-proof and durable, perfect for recording lectures ,meetings, interviews, speeches etc. This Item does not support external TF card.